The bio-research partnership between Emory University and the Georgia Institute of Technology has produced biomedical discoveries for decades, one of the most dramatic being the recent successful human clinical trial of a microneedle patch for flu vaccines. Georgia Tech and Emory University are connected by twisting ribbons of asphalt, five or six miles long depending on your destination. It's a route that Bob Guldberg, executive director of the Petit Institute for Bioengineering and Bioscience at Georgia Tech, knows well. "When I started I was going to Emory almost every day for my in vivo studies, and to be honest, if it wasn't for Emory, I would not be at Georgia Tech," says Guldberg, who came to Atlanta fresh from the University of Michigan in 1996, as an up and coming leader in orthopedic musculoskeletal research, which didn't really have a presence at Georgia Tech at the time. "But there were potential collaborators in orthopedics at Emory," he says. And that made all the difference. Guldberg came to Georgia Tech and has been a grateful beneficiary and influential proponent of the unique cross-town research partnership ever since. 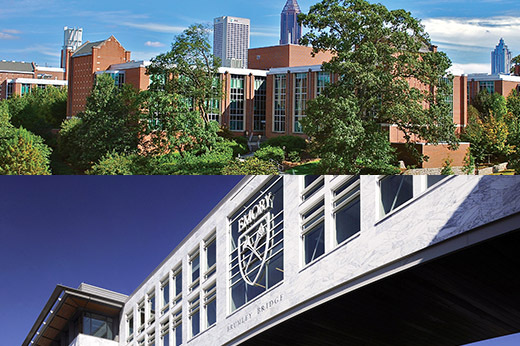 "That seed grant program was absolutely essential and its influence on the success of the Emory-Georgia Tech partnership can't be underestimated," says Bob Nerem, founding director of the Petit Institute, which launched in 1995. "It provided a foundation for everything else that has taken place since."